There’s been a lot going on, and the fates have not always been with us. That’s the way wildlife work goes, sometimes — you take the bad with the good. 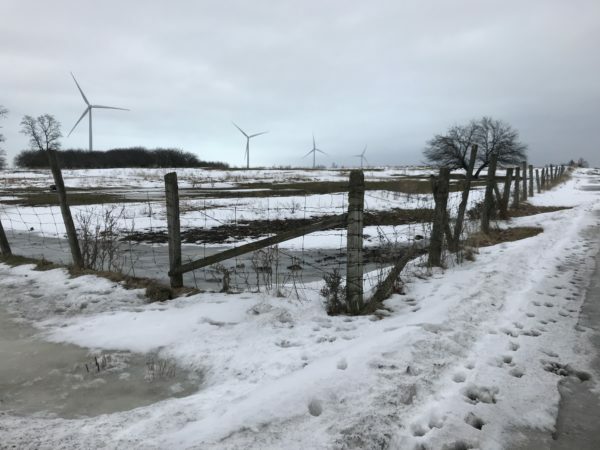 For example, one of our major goals this winter was to deploy up to five transmitters on snowy owls on Amherst Island, to continue our multi-year look at how the presence of more than two dozen newly built wind turbines may affect the movements and behavior of the snowy owls that traditionally use this 70 square km (27 square mile) island on the Canadian side of Lake Ontario. Certainly there was no shortage of owls — a population boom of meadow voles attracted a host of raptors there this winter, including as many as 41 snowy owls (and possibly more) in late December. We had a team of banders ready to go right after the first of the year, including colleagues with Nigel Shaw’s Simcoe County (ON) Banding Group; David Okines of Prince Edward Point Bird Observatory; and Rebecca McCabe, who is doing her Ph.D. at McGill University working with Project SNOWstorm’s data. What we didn’t have was an updated permit from the Ontario government. The permit renewal, which we expected in December, took weeks longer than expected. Plans for the trapping trip kept getting postponed and postponed, until we were down to the final days when everyone was still available. That’s when the permit finally came through. So with only days to spare — and despite some nasty weather predicted — Becca and Simcoe banders Charlotte England and Malcolm Wilson headed to Amherst last week. 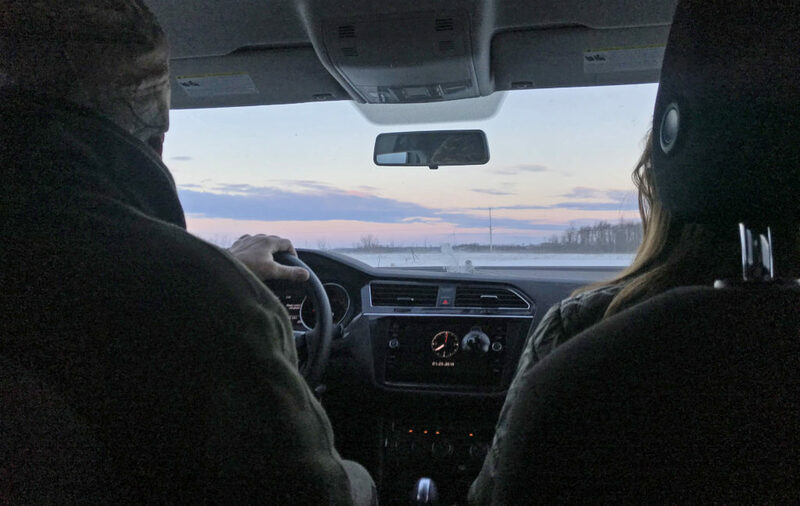 Our colleagues from Whitefish Point in Michigan, Nova Mackentley and Chris Neri, were on call a few hours to the east in northern New York, where they were visiting Nova’s family, ready to help fit owls with transmitters on Amherst if the trapping team was lucky. Becca’s team gave it their best shot, but the weather (including snow the first day, high winds thereafter) was against them, as was the abundance of voles — it’s hard to lure in owls when they hardly have to work for their dinner. The crew tried for three long days, and had a few close misses, but finally bowed to the inevitable last Friday — Becca needed to get back to McGill to teach, and Malcolm from Simcoe needed to fly home to South Africa, where he studies raptors. Despite the disappointment this year, we’re not giving up on the Amherst project. 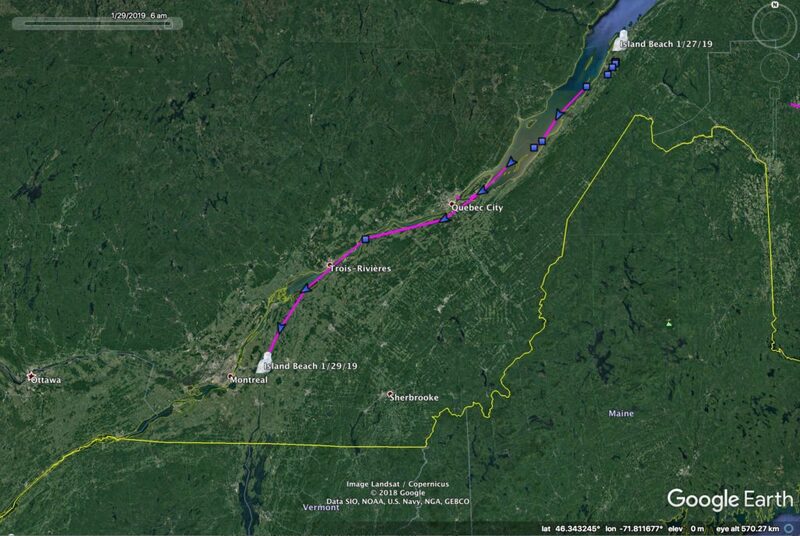 We have several years of movement data prior to the start of turbine construction, and data from two owls (Stella and Emerald) that we tagged last winter while construction was ongoing. The turbines aren’t going anywhere, and we’ll be back next winter to fit more owls with transmitters so we can determine whether snowy owls are as sensitive as some open-country birds have proven to be to the presence of tall turbines. In the meantime, warm thanks to our friends on Amherst who help facilitate our visits and work on this special island. Now let’s do a quick round-up of what’s happening with some of our tagged birds. Island Beach is back on the board. After coming south from the Arctic in late November to southcentral Quebec, and dumping thousands of GPS points showing his summer movements, Island Beach’s transmitter (which has had recharging issues since last winter) went dark. 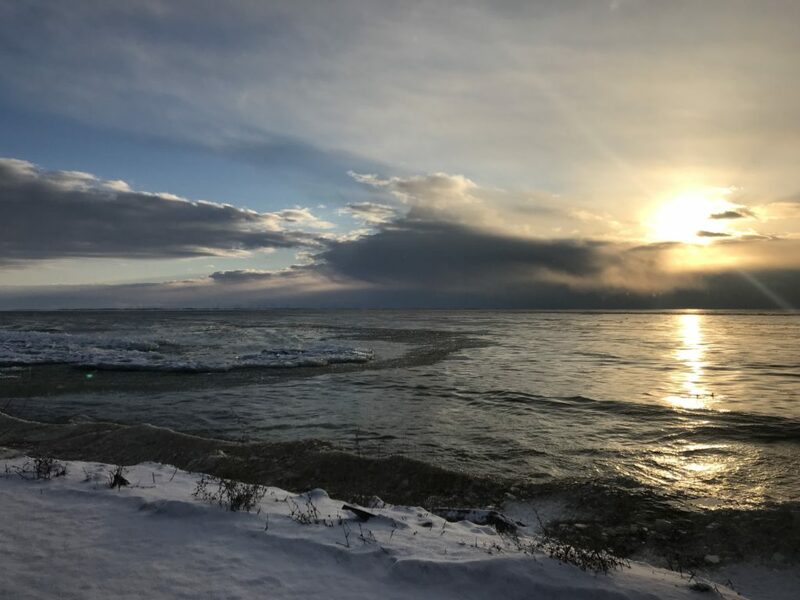 But as the days have been getting longer, he’s been back in touch more regularly, checking in Jan. 27 along the southern shore of the St. Lawrence River near Rivière-du-Loup. Then he made a very rapid movement, traveling almost 400 km (250 miles) southwest along the river, past Quebec City to just east of Montreal by the morning of Jan. 29. (Wells, who had been in Quebec City itself, has been a no-show recently.) 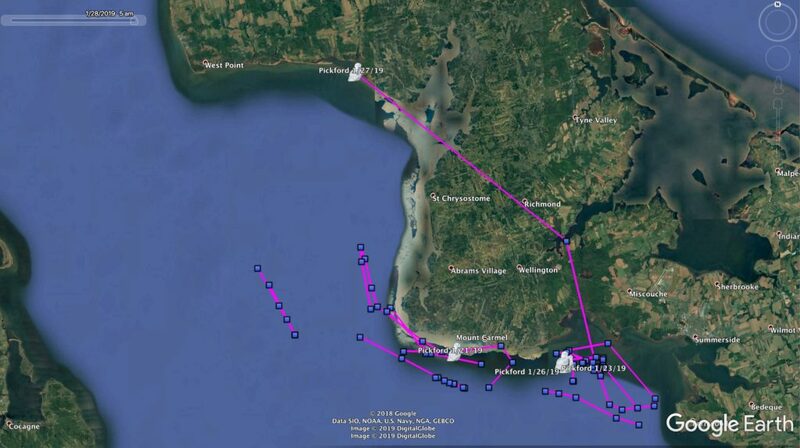 Island Beach was moving at speeds from 61-79 kph (37-49 mph) when he was in flight. Over on Prince Edward Island, Pickford continues to shift on and off the ice, and on Jan. 27 was at Brae Harbour on the southwest edge of PEI. In upstate New York, Otter, our owl tagged with one of the world’s first hybrid cellular-satellite transmitters, is using the farmland north of Watertown, an area where we tracked Orleans a couple of winters ago. Tom McDonald, who has been studying snowies in this area for three decades, has noticed that Otter is using a lot of the same roost and hunting spots that other owls have occupied over the years — a reminder that certain landscape features are always going to attract snowy owls. 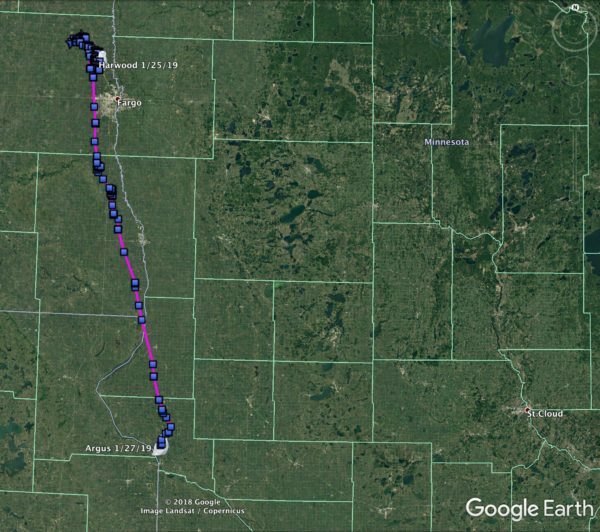 The biggest movement we’ve seen in the past week was from Argus, the adult male that Matt Solensky tagged north of Fargo, ND, on Jan. 20. We’d hoped he would stay put, since Harwood was right in the same area and we looked forward to more interaction between them. But while Harwood isn’t budging, Argus headed south, flying more than 137 miles (220 km) between Jan. 24-28. At last report he’d crossed over to Minnesota between Ortonville and Madison, just east of the South Dakota line. Up near the Canadian border, Woodworth remains south of the Turtle Mountain plateau, though between Jan. 21-24 he took a jog about 22 miles (35 km) west past the town of Bottineau, ND, whose claim to fame is “Tommy the Turtle” — a 30-foot (9m) high statue of a turtle riding a snowmobile. (Woodworth did not stop for a selfie.) And after wandering a bit earlier in the winter, Pettibone has snugged down into a fairly small area near Aylesbury, Saskatchewan, of about 8.9 square km (3.5 square miles).